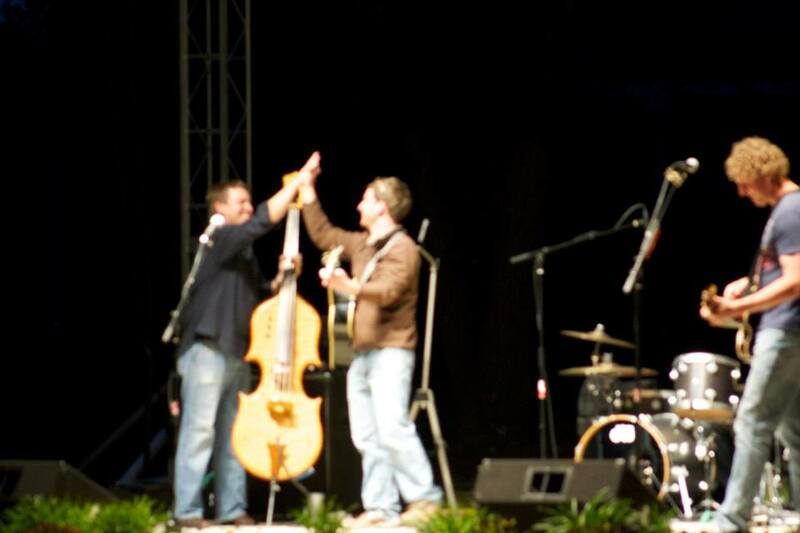 A blurry photo of me playing with my old professor, Mark Bryan (Hootie & the Blowfish, right) and his band, The Occasional Milkshake. One of the unavoidable realities of working in the arts is that you’re always around art. Always. For one, your job is to produce/present/promote the arts. So for eight to twelve hours a day, all you do is talk about art, figure out how to fund art, build art, run the numbers on art, move chairs so other people can see art, and see art yourself. Then as the time card is finally punched and you head out with your family and friends, you’re most likely going to be around even more art – because your passion and your job just happen to involve what everyone else enjoys in their time off. It’s kind of like living at the beach and when your friends come to visit for Memorial Day, all they want to do is go to the beach. I’ve always loved music, and live music even more. I’ve built a hefty collection of “Live at…” albums and DVDs over the years because I love the live performance. Concerts to me are sacred events that, much like live theatre, require a trust between the artists and the audience. And it’s in this trust that the “magic” of live performance comes alive. The lights, the countless speakers, the instruments laid out before the lights dim, the standing and waiting, the merch table, the pointless conversations about when the band may actually emerge (like we’re all experts or something)…it’s all a part of it. But somewhere along the line during this start of my professional career, a bit of that magic went away. I can’t pinpoint the exact moment, but my guess is it rested somewhere between the one concert I hosted at work during an ice storm that only had eight (yes, 8) people show up, and the moving of 2,000lbs and the walking of 10+ miles every time I hold a concert outdoors. But all of the sudden, I began noticing myself not appreciating live music as an audience member as much as I used to. Sure, I had some great concert experiences during this “dark period” – Jay-Z & Kanye West’s “Watch the Throne Tour” was one for the books I tell you – and I cannot honestly say that I lost ALL love for live music, but I found myself hating the crowds, hating the venues, hating the ticket fees, and instead of enjoying the live show, I was looking for the sound techs, counting the number of speakers, wondering which way would be the best way out later, and before I knew it, the show was over. My brain would wander off into a world of logistics and planning, like I had something to do with the show itself or something. For the first time in awhile, I’m having new experiences with live music that I’ve never had. From booking opportunities at work, to closer relationships with artists at various levels, to discussions right here at home about how to make our community more supportive of live music and local artists, to even jumping on stage and playing with a band performing at my venue. I seem to be seeing a whole new side to live music. I think I’ve finally grown past the “observation” stage that most people in the arts industry experience at some point. Whether it’s running a gallery and only noticing how the artwork is hung at a neighboring space, or catching a show at a different theater and coming away with ideas on building the next set instead of knowing the plot line – all of us in this field seem to go through this stage. We don’t really grow out of it though, we just grow past it. I still count the speakers, notice the crowd control, and guess how much the band cost to book – but I’m also listening more and appreciating the entire experience a lot more. I don’t know what it is about this year, 2015, but gosh darnit, I’m falling back in love with live music. And I’m so happy about it.